From 2000 to 2005 with a group of friends I was doing 6 track days a year, one a month through the summer. Then the group disbanded as people moved to different areas for work, one friend gave up after an accident at Brands, and I had to sell my bike due to financial constraints. So now that I've been biking again for the last 5 years, I've been thinking I'd like to see if I could still manage a track day. At the MCN show last year I met a friend on the Silverstone Yamaha Masterclass stand, Andy, who instructs for them. Andy tried to talk me into booking a Masterclass, they sound like a great day but they were too expensive for me. He then suggested booking a track day in the Black Friday sale, but I said I don't have a suitable bike, so he said he could lend me one, and the decision was made. So I found myself at Silverstone on a damp and chilly Wednesday morning a couple of days after the MotoGP was rained off. I got there at 7AM, Andy was bringing the bike with another in his van but was delayed by traffic, so I went to sign on. I had been put into the Red group, which Andy said was rookies, and probably appropriate for me on a borrowed bike. As I looked around the garages in the Red area I could see a lot of very exotic looking bikes, all with tyre warmers, and some with piles of spare tyres, wets on wheels, and also a few BSB teams. Talking to one of the riders confirmed I was in the fast group, so I hastily made my way to the organisers to request a move to the novice group. Having done that I could see I was now in the company of a variety of road bikes, and felt slightly more comfortable, although still rather anxious. Andy arrived and unloaded the bike I was to be using, an early GSXR750 (possibly SRAD generation) which had been one of his brother's race bikes, and from the stickers on the fairing I could see it had been campaigned in 9 Manx GP's. It had full Maxxton suspension, a big steering damper, and about 15 degree of steering lock. It also had been fitted with new front brake pads, new tyres, and the rear brake wasn't working. So I headed out on the first session, on a still wet track from early morning rain, on a bike I had never ridden before, on a circuit I don't know, on new cold tyres. What could possibly go wrong? Silverstone GP is a long circuit, and I had no idea where I was going. I had hoped that Andy would be able to guide me, but he had been asked to instruct a Masterclass client for the day. I came in after wobbling around the first session wondering what I was doing there. Looking at the tyres revealed a 1" chicken strip on the right , 1.5" on the left. On the second session the track had started to dry so I felt more comfortable cranking the bike over, but I was having trouble changing down. At the end of the session I came in and found the rearset gear lever was binding on it's pivot. WD40 wasn't making any difference so stripped it, and found the gear lever had seized on it's bush ( the bike hadn't been used for a couple of years) so the only movement was the lever and bush turning on the footrest mounting bolt. Later it seemed to get better, but only because the footrest came slightly loose! By the afternoon I felt much more confident, and roughly knew the layout, but still not the best lines. Silverstone is such a wide track that you can get away with a huge variety of lines at the relatively pedestrian pace we were circulating at. The last two sessions were really fun, I had picked up a companion on a RSV4 Aprilia, and we were having a great time chasing each other around. 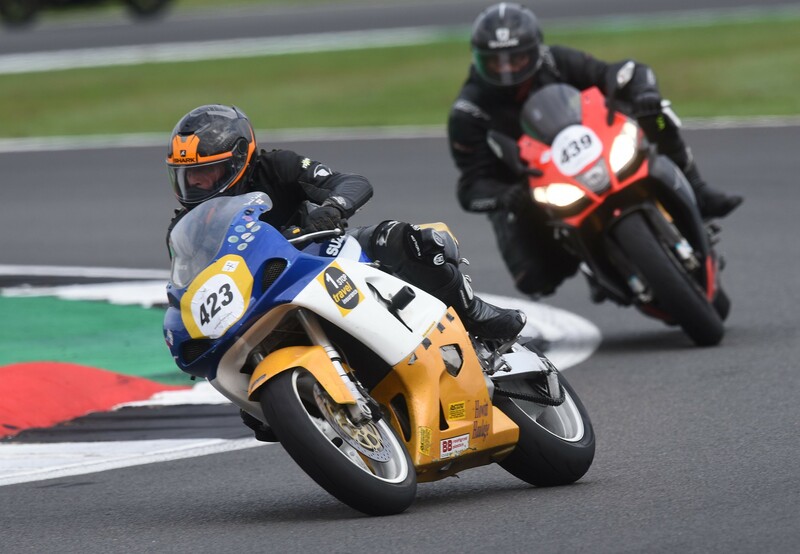 The Old GSXR750 and the Aprilia 1000 were exactly matched for acceleration, he had better and more consistent lines in the tighter corners, I was prepared to chuck it in faster on the big sweepers. It felt like really epic racing, then just when you felt you had the bike on it's ear an instructor would come past 20mph quicker and carrying another 10 degrees of lean. It is a fast circuit though, I was hitting 140 at the end of one of the straights. At the end of the day I felt relieved that I had done it, not made a fool of myself, and got back to around the level I used to be. And whilst it was really enjoyable, I'm not sure about doing another one in a hurry. It was kind of proving a point to myself that whilst an old dog can't learn new tricks, it also doesn't forget what it already new. Next on my list is some offroad riding, maybe a long weekend in Spain, and then I really want to do a big trip in India or Nepal on an Enfield Bullet. Interesting read. Good to see you return to track action. I have never done a track day and I should really address that at some point. The off-roading, Spanish trip and Bullet across India all seem like a worthy entries on anyone's bucket list! I'm hoping to get back into off road riding, in two minds about the best route to go atm.... but have the Dirt Bike Show to go to later in the year which may help me decide!